Classic B & Vintage A Team Race. It was the end of a wet and windy winter’s week in Melbourne. 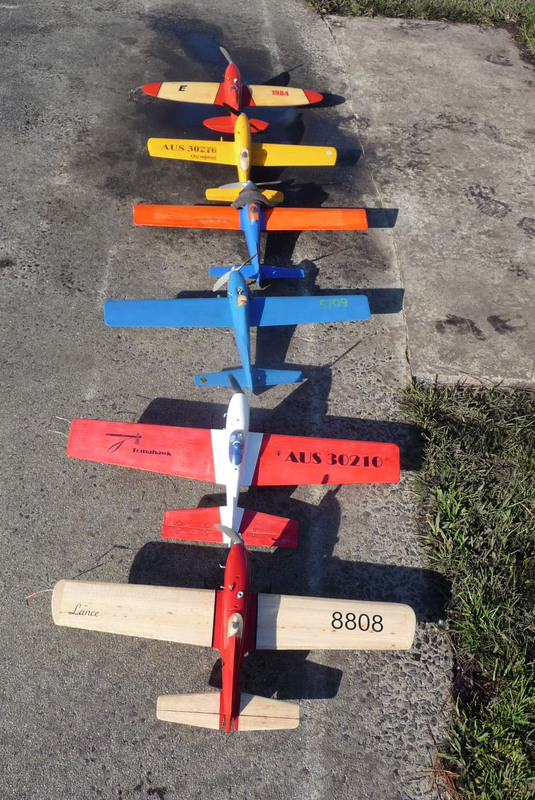 Just a few hardened enthusiasts fronted for a fly at the Frankston club contest day. The field was too wet to mow, so rather than have no B racing at all, it was decided to hold Time Trials for Classic B on the hard circle. John and Andrew were there early to continue testing the Parra powered yellow Tiger Classic FAI. It was working well with both speed and laps on the money. Maybe there will be one more session before the Albury competition in early October. Then it was time to test the magenta Classic B Rocket, which had the Irvine, swapped out for an OSFX. It immediately showed good speed with a best of 15.1 seconds for 7 laps. 15.1 is about 119 mph or 191 kph. Paul Stein had also swapped the Irvine 25 for an OS FX 25. The sleek grey Rocket was having its first FX flights with Murray Wilson on the handle. Paul was all smiles as the model can now do 50 plus laps on every tank of fuel. There is still more airspeed to come, but Paul’s quick stops still saw a smart 2.55.19. Harry Bailey and Peter Roberts also showed good form with the ‘old faithful’ Irvine Galaxie, recording a 2.59.30. This would have to be the only time in the history of the world where every competitor in every flight in Classic B has gone under the 3 minute barrier! Solo time trials must make a difference! Everyone was looking forward to lunchtime and the big pot of soup that Peter Roberts had brought to the field. It was the ideal recipe for a cold winter’s day. Master Chef Andrew Nugent spoiled us with his special lamb shank soup a couple of weeks back. It was always going to be a hard act to follow, but Peter rose to the occasion and delighted all with his hot and tasty veggie soup and fresh bread rolls. Pressed for the recipe, Peter divulged this… A couple of litres of chicken stock, two onions and garlic cloves, a can of beans, a can and a half of crushed tomatoes, potatoes, carrots, celery, pumpkin, turnip, peas, broccoli stalks, plus a few red lentils and soup mix. Sure works a treat! Many thanks to Peter and Andrew for demonstrating their remarkable culinary skills. After lunch the lines were rolled out for Vintage A. My Elliptical was ready to go. The first flight had the lines bind on takeoff. A bit scary for the first lap but was soon under control. I had neglected to do what I always normally do…. check the lines to eliminate the twists and then give them a wipe. That done, we tried again, only to have the wind blow the model in on takeoff. Will be fitting some more tip weight before it’s flown again… Strange, as it’s been flying without any such incidents for the past 3 or 4 years. The first Vintage A two up heat saw Harry Bailey and Peter Roberts get their act together nicely with a slashing good time of 3.17.62 from the very sharp Tomahawk. The R250 sounded great on the Graupner 7×7. Ken Hunting and Murray Wilson finished second in 3.59.50. The Vintage A heats were run two up as there were only 4 teams and it was quite windy. Andrew and Mark were keen to take on the Tomahawk with the Dimpled Dumpling. They did well with a 3.21, but reckoned a sub 3.20 was achievable in the second heat. However, again the D.D. cut in the wrong spot and Andrew chose a long glide rather than risk a broken wing… so a 3.24.75 went into the notebook. Harry and Peter had another crack, but it was a tighter, closer race without the overtaking opportunities offered in the first heat and a 3.23.97 was posted. Results of Classic B Time trials.